The next big hat trend — but what’s it called? Is there a name for this kind of Russian-y rolled-brim beanie? The mega version above was worn by half the models at the Victoria, Victoria Beckham show, but I’ve been noticing them popping up here and there. Witness the bright pink one on street-style darling Miroslava Duma, and the vintage YSL green number on Refinery 29’s Christine Barberich. I don’t think I’ve ever stumbled across a pattern, so if nobody beats me to it, I might have to work one up. Because I’m telling you: all the rage next year. This entry was posted in Finds and tagged fashion, fashion week, hats, knitting, runway, victoria beckham. Bookmark the permalink. 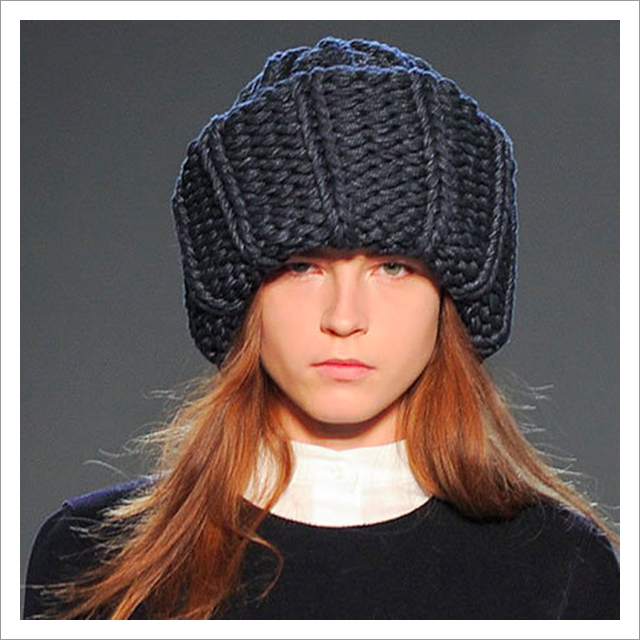 Knitted hats were EVERYWHERE on the runway this season! I always say I can’t wear hats because my head is too big, but maybe this is the way for me to go! I think I saw a pattern somewhere…I’ll see if I can find it, but I am SURE yours would be better! If you get your hands on a pattern, would you please share it – I’d love to have it. I’m just returning to knitting and this could be a good re-entry project for me! twinkle handknits chunky would have been perfect for this! I think its discontinued…OR purl bee’s new super soft merino! Oh, somehow I missed those links when going through the comments by email earlier. That’s the basic idea, for sure! After I wrote this last night, I immediately sketched a little schematic and made some notes, based on Purl’s Super Soft. I’ve been looking for a good excuse to buy some and think it’d be perfect for this hat. Planning to order it this morning. Yes! Make a pattern for this pleeeeeeeease (for all us ‘lazy knitters’ out there!)!!! This is the one I was thinking of, but it’s more “Russian” than beanie/cap. Rowan has some hats, but they are not as big. So it’s a knit interpretation of a ushanka, without earflaps. Oh I love this. Since we’re in a perpetual winter, I definitely need this, in this color! Maybe you need it in a nice perky color to get you through the long last months of winter up there. I’m excited for this!!! I just designed a chunky hat that I’ve been wearing every day for the past two weeks. I feel like a trendsetter! Vot doz “! !” mean? Spasibo!